This business is not easy no matter what way you look at it. Performing onstage night after night is no easy feat- it’s physically and emotionally exhausting and requires a dedication that most people simply cannot muster. The dedication to one’s craft will be tested time and time again through an acting career- it overflows with rejection and heartache, as I covered in my previous article and sometimes it feels like you’ve been beaten down to the point where you have nothing left to give. Everyone knows what it feels like to not be cast in something, but something that not every actor experiences in his or her career is understudying. Understudying is ridiculously hard and nobody talks about it. I’ve understudied twice in my life- the first being five years ago when I was in a production of Of Mice and Men at the Sherman Playhouse in Sherman, Connecticut, and more recently earlier in a production of Our Lady of 121st Street this year at my school, Western Connecticut State University. After nearly 16 years of being onstage and over 30 productions that I’ve been involved in, these two roles were by far the most difficult I have had to date. Understudy roles aren’t necessarily difficult because of the pieces that you’re required to memorize, they’re difficult because of human nature. As an actor, we have a thirst to be the center of attention whether we like to admit it or not. Being cast as an understudy is an easy way for even the best of us to become jealous and bitter. Sometimes, without even realizing it, you begin to resent a director, your fellow actors or even the production itself. This is especially common when you’re not being paid to be in a production and you feel like your time is being wasted when it could be spent working on something else. It’s a little different in the professional world because you’re being paid to be there and you’re still adding to your resume, but it doesn’t necessarily make you feel better about being the second choice for a role. There are times when you understudy and you feel like you don’t matter, that nobody would care if you existed or not, when it seems like the only time anybody ever acknowledges you is if you show up five minutes late to rehearsal. (That’s not to say that punctuality isn’t important. Punctuality is very important and don’t ever forget it.) The reality is, if you choose to accept an understudy role, you need to be just as professional and dedicated to the show as if you were playing the lead. As an understudy, you may not be the center of attention all the time but that does not mean that you are any less important than anyone else involved in the show. Understudying requires you to pay attention to every little thing, to have laser focus on all parts of the show and not just those that your character is in. Sometimes actors tend to only focus on the scenes their characters are in, but that’s not the case as an understudy or a swing. Swings have even harder jobs- they need to memorize multiple roles and have to be ready to be thrown in at a moment’s notice. They need to know the entire production inside and out in order to effectively do their jobs. Also, it’s hard to deny that when you see a show develop night after night you begin to understand it better. In some cases, you can even find an even deeper connection with the piece than the actors in the main cast. Never forget that you are so important and you are never just an understudy. Sure, you don’t get many rehearsals (if any) and if you do go on, you’re basically being thrown into the fire so to speak, but that’s what makes understudies so fantastic. You have that ability to be ready without hours of rehearsal time and be just as effective in the role as the person playing your character in the main cast. That itself is wild and awesome! If there’s an issue with a member of the main cast and he or she can’t go on, there’s no show without you. It’s easy to forget how much you mean to a production if you can’t go out every night, but in the times that it counts, you will be appreciated for being there. Not to mention, being a dedicated understudy will give you more opportunities with a director if they see how hard you work and word-of-mouth between people in the business will get you far as well. Let me tell you, if you do get to go on as an understudy, enjoying the fruits of your labor will be more than enough reward for the frustration of sitting on the sidelines night after night. Each of the understudy performances I was so fortunate to do were some of the best times I ever had onstage and arguably, the best performances I’ve ever given. There’s just something that drives you when you know you only have one shot to get it right, and often times your audiences are filled with people who are your biggest supporters and are grateful for an opportunity to see you on stage when they would not have been otherwise able to see you perform. When I did Of Mice and Men, I performed for my family and a group of eighth grade students whose school had arranged a special performance of the show to coincide with the lesson their teacher had in school. For Our Lady, I performed in a special understudy show that our director had set up for us where our families, friends and peers would be able to come and see us do the show for free. These audiences were so wonderful, interested and appreciative- they let us know how much they were invested in the stories we were telling. In those moments, I actually felt like I was a star. 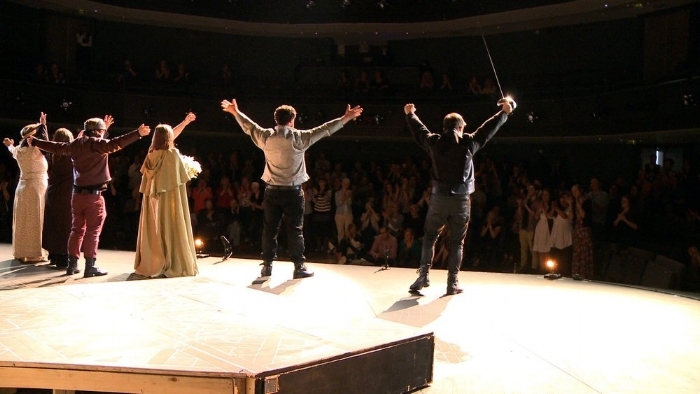 Not to mention, the way those audiences reacted for the bows was incredible! I made a conscious effort to try to stay reserved when I took my bow, but when dozens of people cheer for you as you walk out on stage it’s really difficult not to grin from ear to ear. If I have learned anything through understudying, it’s humility and an ability to appreciate the work that every actor does when they perform a role in which they give their heart and soul on stage. You really gain an appreciation for the different ways that people work, including that of your director, stage managers and even stage crew. Having an outsider view allows you to see the beauty of theatre and all that it is. I grew and learned so much in those two shows when I didn’t expect to. Even if I didn’t see how important those shows were going to be at the time, I am so grateful for the opportunities I was given and hope to become a better actress because of them.